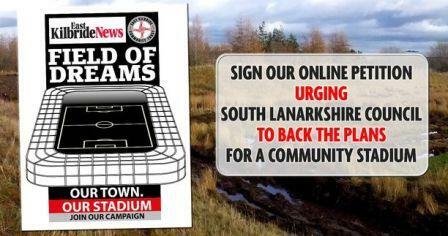 The East Kilbride News today launches our campaign urging South Lanarkshire Council to back plans for a new community stadium in Langlands. And we are asking the town to get behind East Kilbride Community Trust’s proposals to build a 4000-seater state-of-the art facility by signing our petition. The multi-million pound sports hub would benefit so many people and bring jobs to the town. It would play host to East Kilbride Football Club matches on an artificial 11-a–side pitch and be open to football teams across the town. This proposed stadium would also boast a fitness and well-being rehabilitation suite, boxing and martial arts club, as well as facilities to accommodate children with additional support needs. Plans to bring such a facility to East Kilbride have been fraught with difficulties in recent years. We believe our town has waited too long for this. It’s time for our elected representatives to listen to the East Kilbride community. Take a look around our town and you’ll see what East Kilbride has lost. Motorola – gone. Rolls-Royce – gone. Thomson Litho – gone. East Kilbride needs something to bring it together, to lift our spirits. And we believe this stadium could be just the ticket. It’s time to build, bring something positive on quite a bleak horizon. This is our town. And this can be our stadium. A venue where sport can flourish. A place where people of all ages can thrive. So the News are urging South Lanarkshire Council to approve the Trust’s plans at their Planning Committee meeting on May 25 and do all they can to help facilitate this. No public funding is needed for this project to go ahead. The ball is in the council’s court now and it’s time to help the Trust achieve their goal.